When looking at the trailers for Collateral Beauty, the first obvious comparisons are to that of A Christmas Carol. Some may see that as a negative, but going in, at least perhaps we could expect a modern-day retelling of the timeless themes that made A Christmas Carol what it is. However, instead of the miser Scrooge dealing with a tirade of ghosts, Will Smith would be confronted by the personifications of death, time and love, and who wouldn’t want to talk to some of the biggest driving forces in this rat race we call life? It all sounds like it would at least make for an interesting exploration into the human condition, but don’t be fooled by the trailers, the real plot is absolutely nothing like what was conveyed in advertising. In fact, the actual end product is so much worse. Collateral Beauty stars Will Smith as Howard Inlet, a once devoted father and business person who has since slipped into a deep depression after the passing of his daughter. With his employees’ jobs in jeopardy, and an indifferent Howard unwilling to do anything about it, friends Whit, (Edward Norton) Simon, (Michael Pena) and Claire (Kate Winslet) decide to hire an investigator that will decide if Howard is mentally capable enough of holding responsibility for the company. 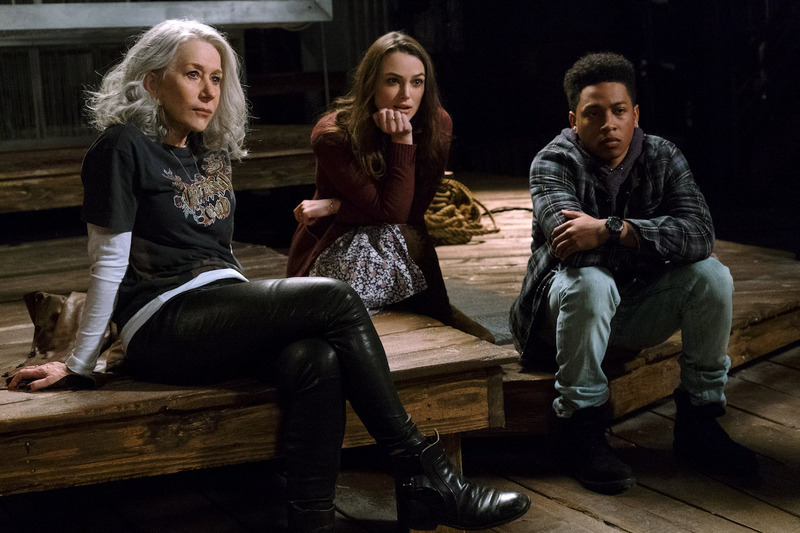 When the investigator discovers that Howard writes letters to the concepts of time, love and death, the group decides to hire three starving actors (Jacob Latimore, Keira Knightley and Helen Mirren) to trick Howard into believing he’s meeting with the personifications of each concept. If those trailers weren’t misleading enough, Smith’s character doesn’t feel like the actual focus of the narrative to begin with. Rather, it’s the characters of Whit, Simon and Claire that have more screen time interacting with the three actors, and being changed by their presence. And while Smith feels underutilized and more of a side note to the story, giving a stilted, uninterested performance in the process, the three friend characters do have the more interesting moments to offer. More specifically, Pena has the strongest story of the three friends, battling something that he hasn’t had the guts to tell anyone except Mirren’s “death” persona. The moments they share are inarguably the strongest ones this feature has to offer, especially since the real star of the show is actress Mirren herself. She’s the only actor that’s given enough time to be both funny and heartfelt without forcing either, and her talents shine the brightest because of it. That isn’t to say that Knightley as the personification of love, or Latimore as time, don’t have their moments to shine changing the lives Winslet’s Claire and Norton’s Whit, but they do pale in comparison to what Mirren brings to the table. The brief moments of heart, however, would leave a much more lasting impact if the story itself was anything with purpose or direction. Since Smith is just hamming it in, the “parent coping with the loss of their child” theme is ultimately wasted. The brief moments we feel anything for the character’s loss were quickly washed away by boredom and disinterest, due to how recklessly ambivalent the character of Howard was. He didn’t give a shred of concern over the problems troubling his friends until it’s already too late in the narrative to garner any suppot. Many of us have had to deal with a loss, and yes I understand some people take longer to cope, but even in our bouts of sadness suffered in loss, we still find ourselves reaching out and helping those we love. Howard did no such thing until he was forced by his friends to, and it doesn’t make his dilemma sympathetic. It just makes his character come off as selfish. Lastly, there are not one, but two painfully forced moments that careen this holiday feature right off the rails. Without giving anything away, one involves Howard opening up to a therapist and the part she plays in his loss, while the other twist involves the three in-movie actors playing time, love and death. The surprise curve involving the therapist gave me one of the best laughs I’ve had at the movies in some time, and that wasn’t even remotely what they were going. It made no sense whatsoever, since earlier dialogue Howard shared with the therapist completely contradicted what the surprise reveal was. The secondary reveal is just a giant slap to the face, and will make you question what the entire point was of the character actors in the first place. The phrase “collateral beauty” is just completely made up gibberish. Someone, somewhere just put these two words together misguidedly thinking it was deep and profound, when it means nothing. The writers just have a character or two spout the phrase a few times thinking it would stick in the hearts of its audience, and yet they never take the time to explain what this “collateral beauty” is even supposed to be. And that alone should show you what kind of movie this is, a manipulative, awkwardly complied holiday feature that even Santa wouldn’t put in the stockings of the naughty.